Most candidates have at least 2 or 3 interviews on a given interview day. This means that for the PEI you need to prepare at least 2 or 3 examples as an absolute minimum. So – can those PEI stories come from the same context, just with a different focus? Or do I need to have completely non-overlapping examples? In principle – i.e. if you have the opportunity to do so – it’s definitely better to use different, non-overlapping examples. By using different examples you also implicitly communicate to the interviewers that you have a range of experience under you belt from which you can choose from, instead of needing to stick to 1 single underlying situation. That being said – quality always comes first. If you feel that this one underlying situation makes a clearly superior example compared to all other options you have for a certain PEI dimension, than I would still recommend using the same underlying situation with a different focus for the respective PEI dimension. In respect to “re-using” examples across different interview rounds, you can find a another detailed blog post here. 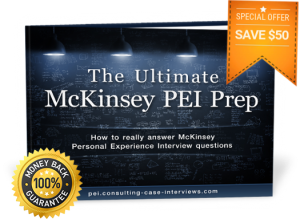 You can find much more information about how to succed in your McKinsey PEI in The Ultimate McKinsey PEI Prep eBook! Previous Previous post: I failed in my previous McKinsey PEI – when can I re-apply? Next Next post: Not yet prepared for my McKinsey PEI – can I postpone my interviews?